Before effective treatments were available, tuberculosis (TB) caused death by attacking the lungs and other organs leading its victims to slowly waste away. During the Victorian age the symptoms of this disease - pale complexion and thinness due to weight loss - were associated with beauty and fashion styles were created to emulate this: tight corsets and long trailing skirts being commonly associated with this look. However changing times and large-scale prevention efforts led to public health campaigns targeting TB and the 'wasted look' making new styles with higher skirts and looser fittings the new fashion for the new age. “We also begin to see elements in fashion that either highlight symptoms of the disease or physically emulate the illness,” Day says. 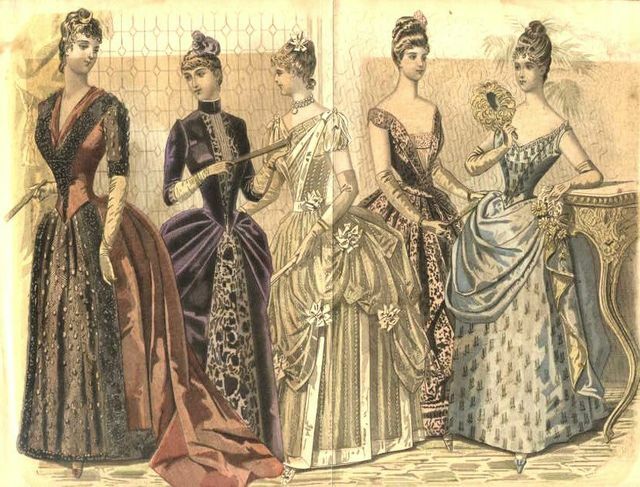 The height of this so-called consumptive chic came in the mid-1800s, when fashionable pointed corsets showed off low, waifish waists and voluminous skirts further emphasized women’s narrow middles. Middle- and upper-class women also attempted to emulate the consumptive appearance by using makeup to lighten their skin, redden their lips and color their cheeks pink.